One of the large epics we set out to create was to promote "celebrities" in our own community. 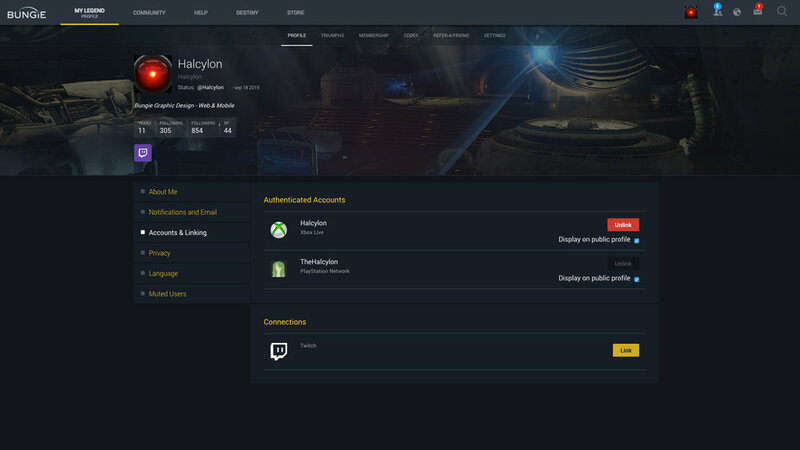 Basically giving most support and tools for our users on Bungie.net to become as popular as Twitch and YouTube Destiny Streamers and Content creators. On of the first approaches was to create a section of the Companion for users to post and share their art, stories, and videos. We created a "Bungie Creations" section where users could do just that. Streaming was the next logical step, but we had a mountain of problems to solve that were mostly engineering in nature. The features for this experiences were too many to count. We wanted everything, but we knew we had limited time and resources, like any project. We also were up against a clock with a release of the game. 1. We cannot be just a "clone of twitch". The experience had to offer more than just what Twitch.com/Destiny offers. 2. We needed to be able to promote a user's stream to satisfy the goal of "promoting our community celebrities". 3. We had to accurately reward users for accomplishing our incentive goal of "streaming for 77 hours". We collaborated with our community team and bribed game team testers to squeeze in an in game reward for streaming in the form of an emblem. This would ultimately effect our data for 'success', but at the time we wanted to rewards people and push them to the companion because we knew what we were going to be able to provide them with. Site wide banner during a live broadcast. Something that popped up during our early investigation, something that is painfully obvious now, was that when Bungie was streaming on Twitch the only place that had no idea or no advertisement of that fact was Bungie.net. We had advertised streams on every social channel excluding our home. 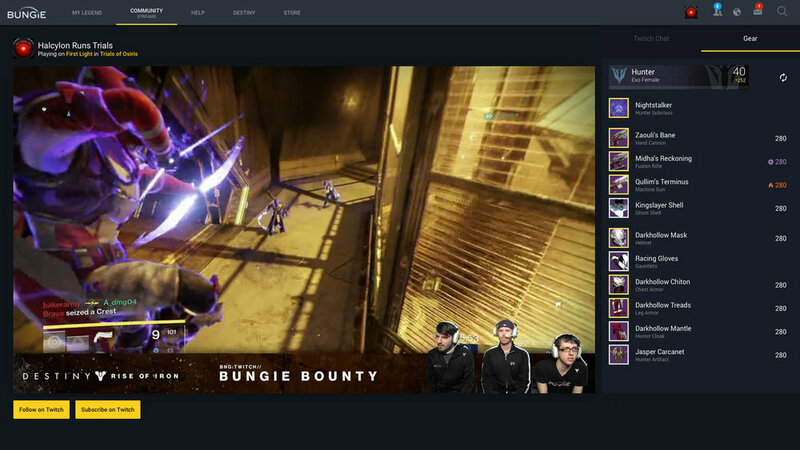 Using our content 'firehose', we deploy a content set that looks for a broadcast from the Bungie channel on twitch and a banner is the displayed on the site prompting a model to pop open for the stream. Successful isn't even the term to use for this feature. This feature wildly exceeded our expectations. Users by the thousands would see the model and watch the stream before closing it. Profile with Twitch linking slat. Profile view when user is streaming. Linking the Twitch account to the Bungie profile was a simple UX problem to solve since we weren't allowing authentication of one through the other. This was just a simple handshake that pointed on account at the other, enabling users to find each other on either service. When we set out to build a Twitch streaming environment, we set the goal to be "better than a clone of Twitch". This meant that whatever we decided to launch with it had to have something more relevant or better than Twitch itself, otherwise what was the point. We were able to include in our browsing library a Game Mode tab and trending viewers which is a proprietary algorithm we defined to ensure that our view wasn't going to just be the popular streams but all streams rising and falling. This ensured we could fulfill our goal of promoting our community celebrities. We shipped this feature full functional and with all the intended parts. What was most interesting is that we found that, while all the feedback was universally positive, the feature fizzled and began to see diminishing returns. Streamers and viewers a like rejoiced in being able to see the gear being used, but in the end, still chose to use Twitch.tv as their primary viewing experience. This could have been for so many reason, but we suspected it was just habitual. Additionally, this could have been because of the rate at which users follow streamer from game to game. Bungie.net only having Destiny could have made that an added hoop for them to jump through. We learned a lot from this experience both from a "what do users want vs. say they want" and internally on our team.